The Mittani (the leader of a sov-holding and obnoxious griefing alliance) wrote a valuable and interesting post. He is surprised that players feel entitled for not being ganked in EVE. He is completely right that CCP advertises every possible way that it's a PvP game where you can be shot down by other players. Someone not knowing the key feature of the game he bought is an idiot. He is also rightfully surprised how big part of the playerbase is completely ignorant about the community aspect of an MMO, despite MMOs are defined as games with community aspect. Someone who plays with a Hulk and never heard of Hulkageddon until the point he is ganked is an idiot. I also agree with his description of other MMOs: while good skills are needed for the endgame, you can get to the top level and play infinitely in a clownsuit with laughable spell choices. Let me add what I had to experience in WoW at the end: good players were forced to carry bad ones who contributed near-zero but got equal chance to receive rewards. I fully agree with "Of course, one of the most horrifying lessons of EVE is that the Enlightenment ideals are false; the power of reason doesn’t actually lift the population out of the muck, because they’re too busy AFK mining or undocking Kestrels full of PLEXes.". There cannot be another solution than his: we must somehow make these people to think. To stop being bio-bots and start being thinking humans. Since I'm more or less completely opposing anything that The Mittani says and does, if we agree on something, it's probably right. However I completely disagree with the practical plan how to do it: "To prevent EVE from becoming a PvP-optional themepark of the sort that coddles this shameful demographic, something must be done - the players who actually do participate in the EVE community must either educate these people about the nature of the game, or blow them up." His idea seems solid: offer education and deliver punishment for those who fail to learn. However his horizon is bound by his intelligence: he suggests something that works on us. When I was ganked, I asked around. I was quickly informed about killboards and the fact that I was passing a very busy lowsec gate in a paper-tanked T1 industrial. I wasn't ganked again, mostly because I'm either flying something that aligns under 2 seconds and still have 8K EHP for smartbombs, or I'm flying an Orca with 200K EHP. I found EFT, forums and learned, just as The Mittani hoped. I'm sure it happened the same for him too. If it worked on us, it must work on them too! No! Being a moron or slacker is not a qualitative state "a bit dumber than me". It's a yes-or-no state. If you apply pressure to an M&S he gives a tantrum or runs away. He is unable to learn in his current state. Ganking M&S and hoping that they start to play smartly is just as good idea as punishing a 2 years old for peeing into his pants. The same thing works perfectly on adults: peeing on the street (along with its usual cause, public drunkness) is punished by law and rarely happens. An adult is capable to understand the demands and capable to control his body. He can avoid peeing outside of a toilet, some just choose to not do so. If we punish them, they'll learn. A child can't. He is simply unable to control his body and must learn how to do it. The child found it normal to pee whenever he pleased in baby-age and it's a new expectation for him now. Just like the average EVE player might encountered the idea that failure has consequences the very first time in his life. Remember, real life is polluted with "protect children from stress", "no child left behind" and other atrocious things. Just like the 2 years old who used to wet his diapers, these players find it completely normal that the World responded to their failure with acceptance and even rewards, repeating that they are special snowflakes and perfect the way they are and deserve flashy achievements in games for logging in. However there is a solution, the one that every child psychologist would suggest: don't punish him for wetting his pants, reward him for sitting on the toilet when he needs to pee. If we want EVE to be a place where M&S turn into useful humans by playing, then the advice of the child psychologists must be followed. Terrible players neither shall be punished, nor rewarded for being terrible. They must be rewarded when they show signs of improvement. For this I'd suggest a simple rule: Highsec is completely safe, but all highsec PvE activities (ratting, missioning, mining, exploring) are designed to provide about 10% ISK/hour of what they would in lowsec. The the fact that other players have much-much better ships will make them want to get it too. Also, to prevent them from peacocking in PLEX-ISK-ed deadspace fitted Navy Ravens, design all highsec PvE activities to make battleships/battlecruisers useless. All rats and missions shall be behind warp gates letting only frigates, destroyers and cruisers in, belt rats are small frigates, no incursions in high-sec. Instead of being motivated by fear (that only leads to childish answers: tantrum or quitting), they would be motivated by positive things: earning ISK, getting a better ship. One by one they would seek out for means to get the rewards. They would fail some times but then they could always fall back to the safety of highsec. Of course to implement this, we would have to deal with another bunch of forum-crying childish idiots: those who derive their fun from beating up someone who can't fight back. They actually love the M&S for providing them constant reassurance that there are worse failures in the universe than themselves. Join the goblinworks channel to get more tips how to make such money. Gevlon, when all you have is a hammer, everything looks like a nail. Mittani has an alliance of easily bored kill-crazy players so they need to be constantly fed a stream of easy targets to kill to keep them happy. Otherwise it doesn't make any sense to go after paying customers who are helping to support the game and aren't actually threatening your own space. The null space game works fine, but not for keeping players who want lots of combat interested. You seem to avoid subject of trading. It's the most profitable/fastest way of earning money and 99% of it happens in hi-sec. If you want to make hi-sec safe but low profit you need to reduce it on everything. And doing that to trading is kind of impossible. You can't allow haulers being invulnerable, badgers filled with billions are suddenly the best transport no one can harm? Then they venture to lo-sec after few months just to produce absolutely hilarious kill mail with astounding losses? The ideas of making hi-sec secure are not possible with the way EVE has established itself. I suggest you start looking on how to 'fix' hi-sec through other means. What I do not understand that you loathed m&s in wow, kicked them out of your group whenever they showed their inability to play properly and now here, in EVE, you are trying to actually change game for them, to make it easier on them. Why this change and sudden developed care for them to make them educated even if they don't want it themselves? For how asocial you present yourself you are developing stupid trait, kindness. @Anonymous: trading isn't PvE activity, you can only trade what other players offer. The hauling will be self-nerfed as autopiloting AFK badgers can compete with the samartest haulers. Kicking M&S from my group isn't harming them. I just rejected to carry them. They did not lose anything they previously owned, I just refused to give them new freebies. One huge thing to take into consideration is the fact that Hulks are 70% Technetium*, and the GSF owns a massive number of moons that generate Technetium. This is most of the reason why they are continuing to offer bounties for killing Hulks. I don't want High sec to be completely safe. This way the traders will be completely immune to all forms of PvP. Instead I want the corp tax to be applied to all sale transactions - both contract and market. If you are a trader that is member of NPC corp then 11% will be taken from you and put into the NPC corp wallet. If you want to sell with no tax - join player corp. I dare to iterate again: the gamer who only spends a few hours in the game per week does not need to be educated. While the game indeed has a social basis, it's not the only foundation of the game, and checking out hostile blogs and toxic forums is neither required nor even a halfway sensible idea to enjoy playing a game. Returning to the topic, i also dare to point out that the Hulkageddon first happened due to very different events. (It was a reaction of Mittani being rightfully punished after his "accidental slip" at a presentation which he obviously prepared for several hours in advance, power point slides and everything. So the whole "accidental" excuse is a joke, too. ) The whole "education" stuff was made up afterwards and in my eyes is no than the attempt to regain at least a minimum of social reputation. It seems like now the Goons desperately try to find an excuse on why they did it, could it be that they're taking too much flak from socually more competent players? All in all, it's a weak and desperate attempt to disguise cheap griefplay as an attempt to improve the abilities of other players. It might work for the Goons themselves and probably is a necessity for them, to calm down and keep those members who actually have a little bit of conscience and realize that large scale griefplay is wrong. Thus we should take it for what it really is: a weak attempt to deflect (justified) blame and to keep members who might else, realizing that they were just used as tools for unjustified "revenge", finally take the step and switch to an organisation with at least some moral foundation. If the Goons buy into it, that's to be expected, after all they now have some kind of excuse on why they did it and their conscience is pacified. If you as an outsider buy into it, on the other hand, you unfortunately display either lack of understanding or can't remember things which happened just a few weeks ago. Thus as a non-EVE player, i understand why the Goons did the move, large scale griefing operations need some smokescreens around their members to keep the operation running, and i am glad the Goons keep the rabble in Eve and thus outside of other games. But i don't buy into their propaganda but rather laugh at them and even more at those who are not even into them and still believe their ruses. Now, it might be harsh, but i think the fundamental basis of this idea is flawed. The gamer actually has a job, where he has to work for several hours per day. Adding up to that, the gamer also has a wife and children, which also want and require attention and thus consume a lot of time. Now, we add an even more incredible thought, playing the game is not the very only spare time activity of this gamer, he might be invested in other activities, which even have a higher priority that some online game for him. Thus, if he only has like two or three hours per week for his online game, you still expect him to keep up with obscure forums, where people are spitting tons of bile at each other, or check out blogs of the-game-is-my-job people, who look down upon anybody not as "skilled" (read as: unable to invest 60 hours per week) as they are? There is no "educating" of those, who just don't have that much time for the game, since they are actually more educated and socially apt than those who try to "educate" them. Sure, one could banter about it, that these players might be better off playing a single player game, but if the multiplayer gives them the fun they are looking for, at a moderate price, why shouldn't they go for it? MMOs, all of them, are very cheap compared to most other hobbies. As a sidenote on that: Sorry to break it to you, but whenever i read about all your "those who pay for the game are doing it wrong", you show that you can only calculate inside of the game. While i'm not playing EVE (but other MMOs), i can see the subscription fees. After tax, i'd work about 20 minutes RL for one month of this game. Even for somebody with much lower income one hour of work should pay off for this month. Your postings in detail explain how you finance your play time by in game activities, but you clearly spend more than one hour per month on doing that. 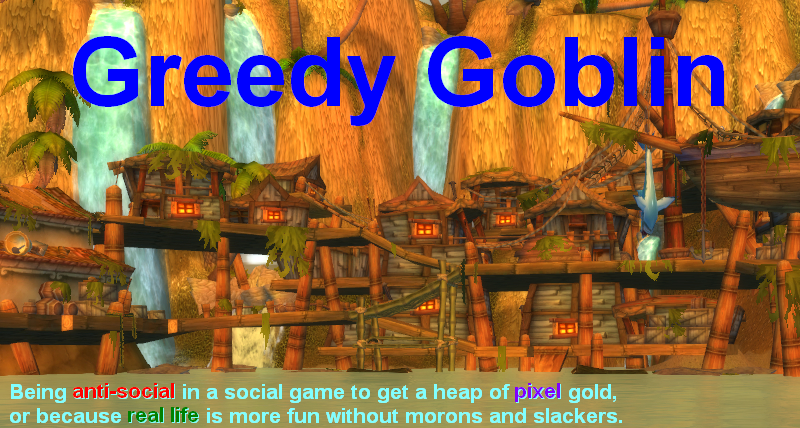 Thus the person who spends the one hour on real work and actually enjoys the game makes the economical sound decission, not the Goblin who spends hour after hour to calculate everything in game, burning his spare time for some "great" in-game revenue, which equals very little money when comparing how much he could have made spending the same time at work. @Sylow: I can buy a boxing bag and hit it for a few hours a week. It's a healthy exercise and can be fun. However showing up in a boxing club with this attitude is probably not the best idea and will end with a broken nose. I hope you get the association with single and multi-player games. While i get your association, i at the same time dare to say that it's flawed in the context. Now, unknown to Goons and some more people, beating up other players is not the only content and reason of existance of multiplayer games. If people rush to 0.0 in EvE and get blown to pieces, alas, that would be the equivalent to your boxing club, but this thing was all in high-sec. If something happens in a higher security zone, though, i would compare it with this picture: some drunkard at a bar gets angry and one or two persons next to him catch one or another blow, before he topples over. Things like that can happen, albeit they do so very rarely. So, according to Goon-logic, which you also propagate here, i either should never meet my friends at a pub, or take a shotgun along, just in case. Also, there is a term for people who intentionally go out to start fights. That's what those Goons and the likes are, albeit only in a game where they can escape retribution in since they would be unable to handle it in RL. Suddenly i experience some minimal esteem for those thugs at the peripery of my group of friends in our wild years. Indeed, they were the losers who were left behind at the parking lot, when we went to our favourite club where they were banned from entry, but at least they handled (willingly or not) the consequences of their actions. I kind of agree with some of Sylow's points. While I admire Gevlon's rapid gain of significant ISK, I'm personally more in the demographic where I want to pay $15 / month and have fun. Rather than figure out how to not pay $15 / month in a way that might not be so much fun. I think this is the finest of your M&S posts. @Sylow: yes, you shall not go to such bars where people get drunk like a pig. Or if you choose to go there, you shall be prepared to find out why "drunk" and "disorderly" are used in the same phrase. EVE is such bar where bikers, truck drivers, whores are welcomed. Deal with it or don't come in. This is the third post in which you propose a way to make the life of a trader (your life) easier. I'm starting to suspect that while you are comfortable with market PvP; you are unable to handle the fact that you can't avoid social or combat PvP. I'm not going to point out that you will have to cope with it. But I will point out that your posts qq'ing about how the game isn't tailored to your playstyle are not constructive or worth reading. Most of us come here because we respect your market abilities and want to learn from that. We would appreciate it if you could post about that more often. Do you just refuse to understand? Or are you simply unable? I am not interested in (combat) PVP. Not at all. But EVE is complex enough that the limited pvp-free content that it offers is enough content for me to be worth the 15$ per month (for discussion sake - I actually make enough ISK to buy PLEX with ISK). Reducing the already limited pvp-free content even further won't make me pvp but quit. For example, I accept that I can't run level 5 missions in high-sec. Remove level 4 missions from high-sec as well and I will leave. Simple as that. And before you tell me I should play some other game (preferrable a single-player game): EVE has been this way for 9 years now. It's not me but you who wants to change it. If you can't live with the limeted pve content that EVE offers (and that a big part of the player base enjoys) it's not us pve players who should leave but you. @Lochiel: I personally wish that they NEVER implement this suggestion as it would ruin my current business completely, as an autopiloting kestrel could carry the books that now my transport interceptors do. My profit comes from proper risk assesment, dodging pirates. Those who are worse in these are either ganked or don't even try. I post these because I believe it would make the game a better place to educate M&S and also it would have more subscribers. "EVE is such bar where bikers, truck drivers, whores are welcomed. Deal with it or don't come in." "EVE is such a game that welcomes risk-averse pve players due it's high-sec mechanics. It even attracts M&S to some degree. Deal with it or don't play it." I think this may be a good time to question the central premise of this blog, that is, that the game would be better without morons and slackers. Now, I can see how the real world would be better without morons and slackers, as the real world is a complicated place, and generally, the more productive a population is, the better society is for everyone. But Eve is not the real world. In game, resources are provided in an artificial way, and there is no meaningful redistribution of wealth, so all M&S do is provide market inefficiency for the smart players to exploit. How exactly is this bad? Why do you want to get rid of them? > You say that rather than punish M&S for being M&S we should reward them for moving away from M&S behaviour, but your suggestion is "Cut their current income by 90% and only give it back if they go to PvP space". in what way is that not a punishment? > For that matter, what's wrong with having M&S in EVE in the first place that makes it necessary to restructure core gameplay to 'encourage' them to change their playstyle? EVE never claimed to be an educational game. > You say "[EVE] would have more subscribers" if these changes went through. How? I can't see this drawing new customers, and you yourself define M&S as those who "don't make the effort" and "refuse to learn"; they're more likely to see their hisec income drop by 90% and quit than learn. > "Trading isn't PvE activity, you can only trade what other players offer." Except that's not really true is it, Gevlon? Based on your posts, you're mostly buying skillbooks from NPCs, moving them around and reselling them. Where exactly is the PvP in that again? You're awfully gung-ho about nerfing everyone else's income streams for the sake of a few poor examples of the playstyle, but yours is sacrosanct? Besides, if you want to establish Lowsec as the new capital of ISK production surely you need to 'encourage' the traders to make it the new market capital? A 90% sales tax in hisec sounds like a pretty solid encouragement to me. > Mittens' posts have less to do with teaching other EVE players and more to do with keeping the Goons from getting bored enough to tear themselves to pieces and keeping the demand for new Hulks and thus the Technetium his cartel controls as high as possible. If he can get other players to do that last part for him, all the better. That's the start and end of his concern in the matter. @Eaten by a Grue: The premise is that the World would be better off without M&S. And you without carrying them. @Hivemind: punishment make them worse off than before. I don't want to retroactively take the mission rewards from them. Stopping them from getting further freebies is not a punishment, it's just not giving more rewards. M&S has the nasty tendency to hold socials back who believe that they can help them or just feel obliged by friendship. The socials are not beyond hope and shall be salvaged. Anyone can sell the same books, lower than me, taking my profit away. I'm not naive, I know that The Mittani can't care less about anyone else but himself. However his statement is true or false in itself and must be addressed as such. Interesting post - first you deem M&S as non-learning drones, then you try to educate them... to what end? Did you consider the possibility that they actually have their place in EVE's ecosystem? You keep thinking on them as consumers/producers, but to me they are just resources - they provide the players with ISK and entertainment. EVE is lacking the PVE content which is so rich in most of the others MMO... except the PVE is actually already here. The M&S are the farmable mobs of EVE. > Saying this isn't punishment because you're not retroactively removing ISK from players is like saying that someone who's just been fired is no worse off than they were yesterday because they've still got the money they earned. Even better, to use your own tortured metaphor it is like taking your incontinent two year old and giving them only 1/10th their normal food until they learn to use the toilet. The players you're talking about nerfing play the way they do to make ISK; leaving their bank balance alone but cutting their ability to add to it is still a punishment to them. > "M&S has the nasty tendency to hold socials back". Hold them back from what? Do you have any proof of this happening in EVE? Surely if socials are doing something for social reasons (which helping or hanging out with M&S would be) they're getting exactly what they play for? Again, EVE is not meant to turn every player into perfectly efficient automata. > "Anyone can sell the same books, lower than me, taking my profit away." And players can scan down a mission site and steal the wrecks there, or even dashing in and stealing the mission objective, hurting a mission runner's profit. Other miners can go after the same asteroids as you to hurt your profits. Exploration is inherently a competition with other players to find the sites first. How does that make them any less PvP than your trading NPC sold goods? > I've read through Mittens' column and the only point I can find is "they must learn that EVE’s difficulty is what makes the game unique and worthwhile", except that like your post there's nothing there that explains WHY they [i]must[/i] be so educated. I've been playing this game long enough to know these M&S have always existed and always reacted like this. Any rise in the frequency of these reactions probably owes more to the rise in people provoking them than it does to a hypothetical sudden increase in M&S players who think EVE is WoW in space. Barring a compelling reason for why these players' mere existence is harming the game (which you have yet to provide, at least for me; see my 2nd point above) I've got to say that Mittens' self-serving statement is in fact false. @Hivemind: stopping providing undeserved rewards is no punishment (despite communists claim otherwise). The fired employee is NO WORSE off than yesterday, since he has the same resume and chance to get good salary as yesterday. Actually, designing your family budget with the assumption that your current job will exist tomorrow is a ticket to the homeless shelter. The 2 years old cannot survive on 1/10 food, the bad players can survive forever with zero ISK income. I'm just stop giving them new toys. You CAN stop buying new toys to your kid at will. The socials have no clue what they lose. They can be competent, successful AND have friends among the other competent and successful. PvP is defined as competing with someone else for rewards. If you sell books lower than me (but above the NPC+broker+tax threshold), you are making pretty good profit = reward. On the other hand you would gain more ISK by running your own mission than ruining someone elses. Fighting mission runners and miners is possible but not profitable. Unprofitable fighting is the definition of griefing. Since every activity in EVE can be griefed, it's a non-argument. My point is (and always was since this blog existed) is that being M&S and M&S-boosting social is a real life trait that manifests in the game, but has nothing to do with the game. Just like typing racist insults in the game chat is not a game issue but a real-life issue. I believe that if M&S and booster-social behavior in the game changes, the people improved in real life, just like the one who learns that telling racists things is not acceptable. But how exactly are you carrying anyone in Eve. You practice Economic PvP, in which you only benefit from the presence of M&S. If you take those M&S and remove them from the game, two things will happen. One, is you will earn less money, as the market will be more efficient. And two, your wealth relative to others will come down, as there are fewer broke people in the game. @Eaten by a grue: so the World will receive some intelligent people and I will make less pixel money. > You keep talking about "undeserved rewards" but you've not explained anywhere why these rewards are undeserved. The players earning ISK in hisec still put in effort to get their ISK and the economy currently ensures they get paid according to their effort; A smart mission runner who researches what buildings drop and what ships trigger what spawns will make more ISK (and lose fewer ships) than one who doesn't. An at-keyboard miner who checks out rocks with a survey scanner before they start mining will make more ISK than someone who activates mining lasers and leaves for 10 minutes. Where is it that that system is breaking down, or what is it that makes those rewards "undeserved"? > In this context, what you are suggesting is a punishment; "You aren't playing the way I think you should so I will take away most of your income until you conform". [b]Rewarding[/b] people changing behaviour would mean leaving hisec income as it is now but increasing the income from sources outside of hisec, except we already have that, and it works; some players move on from hisec missions to lowsec missions or nullsec ratting or WH space sleeper sites. Some move from hisec mining to lowsec or nullsec or WH belts and their ABC ores. They get to reap the rewards for their increased risk and the increased effort needed to do this without losing ships constantly. Some players aren't willing to make that tradeoff and stick to hisec. The difference is that your change would mean they wouldn't stick to hisec, they would mostly quit EVE. > You still haven't provided evidence that this vein of socials who find themselves boosting M&S actually exist below the cutthroat surface of EVE. You haven't explained how that existence is bad for them or for the game. Now you're saying that they "have no clue what they lose" so in other words they're perfectly happy as they are now. Explain to me again why this state of affairs requires radically redesigning the gameplay? Also at some point weren't you supposed to explain how this would generate more subs rather than costing CCP a huge chunk of players who like hisec the way it is? > "PvP is defined as competing with someone else for rewards" so every miner is competing with every other miner to make the most ISK from their minerals. Every mission runner competes with every other mission runner to sell their loot and convert LPs into rewards. Why should trading be exempt from this proposed nerf? > "I believe that if M&S and booster-social behavior in the game changes, the people improved in real life" once again, do you have any evidence of this? More to the point, why does that justify changing the way EVE works now? Yet again, this game is not intended to be an educational tool in your life-coaching experiments and should not be adapted into a worse game just to suit your purposes. Now correct me if I'm wrong, but isn't that an awful lot like a WoW PVP server?